Evander Holyfield and Bob Arum headline the 2018 inductees into the Atlantic City Boxing Hall of Fame. The Atlantic City Boxing Hall of Fame (ACBHOF) has announced its 25 member 2018 Induction Class, which also includes President Donald J. Trump. This epic event will take place at The Claridge, a Radisson Hotel located at Park Place & Boardwalk in Atlantic City, New Jersey on June 1 – 3, 2018. The Claridge Hotel serves as the signature Corporate Sponsor for this knockout weekend, “The Claridge is proud to be in partnership with the Atlantic City Boxing Hall of Fame and to continue to promote professional boxing’s exceptional history in Atlantic City,” says Cem Erenler, Vice President/ Operations & Business Development for TMJ Properties, the owner and developer of The Claridge. The iconic hotel, which is now part of the global Radisson brand first opened in 1930. “Hosting this signature event is in the best traditions of The Claridge, which for more than 80 years has been Atlantic City’s center for exciting events in sports and entertainment,” Mr. Erenler said. 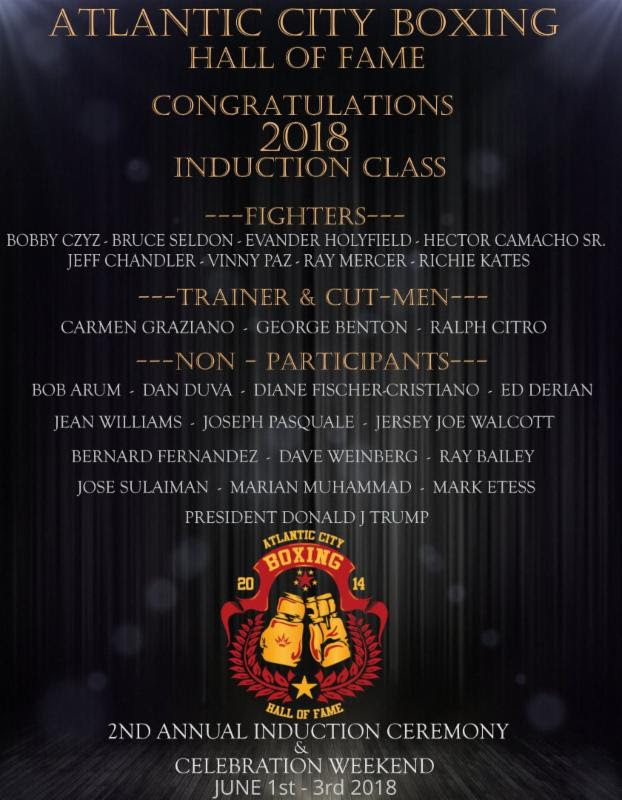 The 2nd Annual Induction Ceremony & Celebration Weekend will honor some of the world’s most prominent trailblazers from the sport of boxing: President Donald J. Trump, José Sulaimán, and Bob Arum are just a few names who will be enshrined with the 2018 induction class. Also expected to be in attendance; current and former boxing champions, and VIP Guests for a fun-filled weekend that’s highlighted by a black-tie evening, and the acclaimed, unforgettable Induction Ceremony. “The Atlantic City Boxing Hall of Fame is here to stay! The epic success of our 2017 Inaugural Induction weekend was pivotal to our brand value in the boxing and business community,” said Rodrick Green Vice President and Business Strategist for ACBHOF. “We are excited about the economic and sports entertainment impact the ACBHOF will continue to have in Atlantic City. Thank you for your support and be reassured that at the 2018 Induction Celebration the bar will be raised even higher. Over the next several weeks there will be updates on the schedule of events, room packages and expected VIP appearances on the Atlantic City Boxing Hall of Fame and the Claridge Hotel websites and social media platforms. “We’re excited about the ACBHOF 2018 Induction Class; I believe our nomination committee did an incredible job in selecting a diverse and richly deserving group of individuals. I’m extremely proud of this class because it contains three remarkable women: Diane Fischer-Cristiano, Jean Williams, and Marian Muhammad. The ACBHOF team along with our partners and sponsors are looking forward to June where we will pay homage to our 2018 inductees,” said Ray McCline ACBHOF President and Founder. All interested sponsors, exhibitors, and vendors who would like to reserve a booth, contact the ACBHOF at (609) 318 -3188 or info@acbhof.com or acbhof@gmail.com. The Claridge Hotel and Brighton Park hold a vibrant and significant place in American history. The centrally situated property is arguably the most desirable plot of land in Atlantic City. The Claridge Hotel, once known by its 1929 nickname “Skyscraper by the Sea,” radiates a breathtaking Manhattanesque design situated in the prime center of the Atlantic City’s boardwalk. One of the last remaining architectural masterpieces from the Boardwalk Empire Era, The Claridge Hotel housed such legends as Marilyn Monroe, John F. Kennedy, Al Capone, Nucky Johnson, Princess Grace of Monaco and Frank Sinatra. The “New” Claridge Hotel boasts an era style décor remodeled in all 500 guest rooms. Many guests favor elegant suites with spectacular ocean/bay views and Jacuzzi tubs. A family of great-tasting natural beverages made with natural flavors, vitamins, and just the right amount of caffeine. HARD® carries the unique advantage of being fully enjoyable as a stand-alone beverage, as well as being designed to blend perfectly when mixed with your beverage of choice. Whether it’s or Original, Citron, Tonic, Club, Ginger, or Grape. HARD® lets you create a bold and refreshing upgrade to your favorites and enjoy a whole new experience. Our product line is the next stage in evolution to their familiar-named predecessors. Why sacrifice your palette for a boost to party all night? Or if you want a mixed drink, why dilute your high-quality spirits with inferior products? Bring out the true flavor of your favorite drink; HARD® is designed to ensure “the usual” is anything but. Most other companies use a large amount of corn syrup, giving consumers, a sugar rush followed by a debilitating crash and an overdose on vitamins that cannot be metabolized effectively, stressing organs such as the liver and kidneys. At HARD® we believe a quality product should be delicious, effective, and crash-free. Our top-quality product delivers it all! Naturally flavored, we refuse to use corn syrups, food coloring, and the artificial ingredients that will slow you down. Designer Wraps® is a premium vehicle & architectural wrapping company. We specialize in full vehicle wraps, custom graphics from our in-house designers, car styling, complete color change wraps, chrome wraps, livery for racing, commercial and fleet vehicles, murals, and custom designed apparel. Also, Designer Wraps offer Signs & Business Solutions to fit the needs your small or large business. This includes pretty much anything you can imagine needing for your business. Our clientele extends throughout the Greater Philadelphia Area and beyond. Since 1991, FantaSea Resorts has enriched lives by providing affordable, dream vacation opportunities to thousands of families in the Tri-State and Delaware Valley. FantaSea Resorts is proud to be the premier provider of vacation ownership products and services in the Northeast, and one of the largest privately-owned hospitality companies in Atlantic City. Ranked with the Better Business Bureau’s highest rating, our portfolio consists of three distinct resort properties – Flagship, Atlantic Palace and La Sammana – each prominently located in the footprint of the destination’s top attractions.